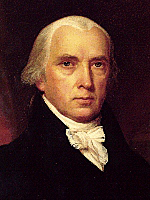 James Madison, co-author of the “Federalist Papers,” was an Episcopalian and trained for the ministry with the Rev. Dr. John Witherspoon. He was a member of the Virginia legislature from 1776-80 and 1784-86, of the Continental Congress in 1780-83, and the Constitutional Convention in 1787. It was in that Convention that he earned the title "Father of the Constitution." “I have sometimes thought there could be no stronger testimony in favor of Religion or against temporal Enjoyments even the most rational and manly than for men who occupy the most honorable and gainful departments and are rising in reputation and wealth, publicly to declare their unsatisfactoriness by becoming fervent Advocates in the cause of Christ, & I wish you may give in your Evidence in this way. Such instances have seldom occurred, therefore they would be more striking and would be instead of a "Cloud of Witnesses." "It is the duty of every man to render to the Creator such homage. Before any man can be considered as a member of Civil Society, he must be considered as a subject of the Governor of the Universe. Although he did speak of a "wall of separation," it is evident that the purpose of said "wall" was to prevent Congress from passing a national law to establish a national religion.